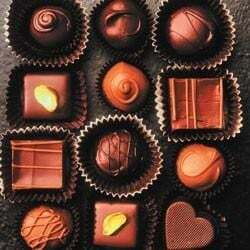 To say that I love chocolate makes a cheap cliché out of how I really feel about the stuff. Let me put it this way: If I had to choose just one or two foods to sustain me on a remote island for the rest of my days, chocolate would be my first choice. When I first heard the news that Chocolate: The Exhibition would be making a stop here at the Indiana State Museum, I was (needless to say) delighted. Having taken a peek, and a taste, I can affirm that the exhibition offers much to savor, in addition to a gift shop the likes of which you’ve never tasted. Chocolate: The Exhibition offers history and lore, science, fun facts, interactive displays and includes relics from chocolate’s ancient past: from clay mugs used by Aztec higher-ups to delicate porcelain put to service in European parlors. When it comes to addictions, I learned I’m far from alone in my chocolate obsession: Americans consume an average of 12 pounds per person each year (that’s a pound a month!) — mere child’s play to the Swiss, who take in more than double that amount at 26 pounds per year (I must be Swiss at heart). Chocolate has been loved and coveted for more than 1,500 years, long before Columbus first pressed his boot into American soil, forever altering the course of history. In its relatively short existence, chocolate has evolved into the endless variations in which we can now imbibe it: from chocolate with chilies to chocolate lip gloss. Touted as the “food of the gods” (although today it’s more often associated with the female gender), chocolate has been revered as a sacred elixir to cure all ills, from melancholy to madness — claims I can certainly vouch for. Chocolate was “discovered” by the Mayans, who are credited with the idea of harvesting the seeds from the football-sized cacao pods native to Central and South American rain forests, crushing them and mixing them with water. The Mayans passed their chocolate fever on to the Aztecs, who took the stuff very seriously indeed, acquiring it from conquered peoples or through trade and other means. It wasn’t until 1500 that chocolate was introduced to Europeans: Spanish explorer Hernan Cortes, decimator of the Aztecs, counted chocolate among his ill-begotten booty, spreading the cheer among the Spaniards for the next hundred years before the rest of Europe caught on to the craze. Someone in Europe came up with the idea of sweetening the frothy drink with sugar, and the rest, as they say, is oh-so-sweet history. Today, the Ivory Coast grows and exports the most cacao of any cacao-growing country; they produced 1.4 million tons in 2000. The majority of cacao is sent to the Netherlands and the United States, among other countries. It is then processed into cacao powder from which it undergoes its many delectable derivations: from chocolate bars to baking chocolate to truffles to … well, you get the picture. Heaven on earth. The Field Museum originated Chocolate: The Exhibition in 2002, and the show has been traveling ever since. The exhibition will remain on view at the ISM through Jan. 5, and includes a number of special weekend programs dubbed “Chocolate Sundays.” Call 317-232-1637 or visit www.indianamuseum.org for more information.